It follows a serious spike in numbers of arrivals. Spain’s coastguard has rescued more than 600 migrants attempting to cross into Europe in 24 hours. That number includes 35 children and a baby — as well as people attempting to make the crossing in a toy paddle boat, a canoe, and a jet ski. As the crossing from Morocco to Spain is fairly narrow — 12km across the Strait of Gibraltar — many use cheap, child-sized paddle boats without motors that allow them to bypass people-smuggling networks and their fees, reported the BBC. It comes as Spain has seen a huge spike in numbers attempting to reach its shores, according to figures released by the UN’s International Organisation for Migration (IOM). Global Citizen campaigns on helping refugees and those caught in crises and emergency situations. You can take action here. More than 9,000 people have arrived in Spain so far this year — three times as many the year before, the IOM reported. More than 120 people are believed to have drowned this year during the crossing. The IOM warned that Spain could overtake Greece this year in terms of numbers of people arriving by sea, saying that the rising flow of migrants to Spain could evolve into a "big emergency" if the pace continues. 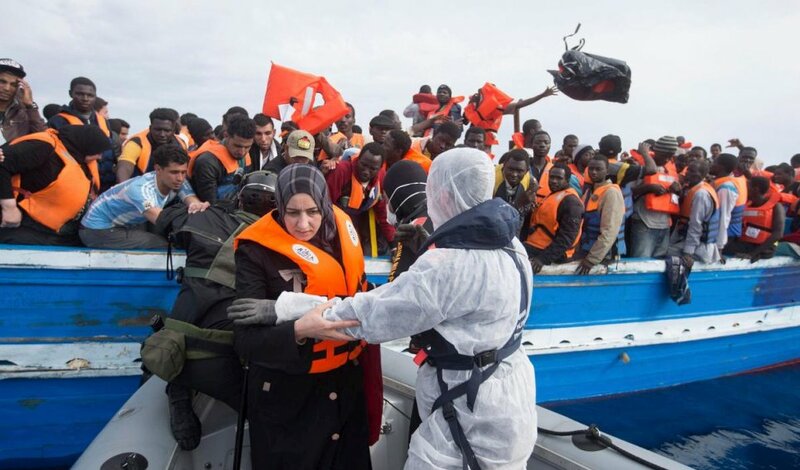 "We understand for our experts in the field that spain now is going through something like what Greece saw in the beginning of 2015 or Italy even earlier," said IOM spokesman Joel Millman. Most of those arriving are from West Africa, including Nigeria, Guinea, and Cote D’Ivoire, which means they are mostly treated as economic migrants, rather than refugees. Spain’s two North African enclaves, Ceuta and Melilla, are also under constant pressure from refugees and migrants attempting to scale the border fences, thereby reaching Europe over land. The rise in numbers of people arriving into Spain comes at the same time as a fall in people arriving to Italy. Nearly 100,000 people are believed to have crossed from Libya to Italy since the start of the year, with more than 2,200 people said to have died, according to the IOM. In June, Italian coastguards rescued an estimated 5,000 people from the Mediterranean in just one day, off the coast of Libya. But in July, Italy saw a 57% drop in the number of arrivals, according to data released by European migration watchdog Frontex. The watchdog warned, however, that the fall in numbers doesn’t signal an end to the crisis. It said factors for the decrease included poor sea conditions in the first half of the month; unrest at Libyan coastal city Sabratah; and higher Libyan coastguard activity that deterred smugglers. The Libyan coastguard is at the centre of the latest controversy over the migrant crisis, after being accused of threatening NGOs and charities that work to rescue migrants and refugees from the sea. Three charities — Save the Children, Doctors Without Borders (MSF), and Sea Eye — have all suspended their rescue work, due to “credible threats” from the Libyan coastguard. One agency that is continuing with rescue work, the Spanish group Proactiva Open Arms, reported being threatened by the Libyan coastguard on Wednesday, resulting in a tense stand-off. “You have to sail now towards Tripoli port. You are under custody, sir. If you don’t follow the orders we will target you,” the Libyan captain warned the Spanish crew by radio, reported The Telegraph. The Spanish ship was eventually allowed to sail away into the Mediterranean.